eyelids to reduce the appearance of puffy, baggy eyes. Eyelid Fat deposits can affect your face at any age. Most of the time occurring after middle age. Your eyes, particularly under your lower lid will start to gather fatty deposits. This will give you the look of being haggard and tired at best or having a puff eyed, hang over look parentally at it worst. Although several temporary cures exist for the hiding the fat deposits under your eyes, tricks like cucumber slices added to a facial regime, none are permanent solutions. Next stop for people that suffer from fatty eyelids is plastic surgery. 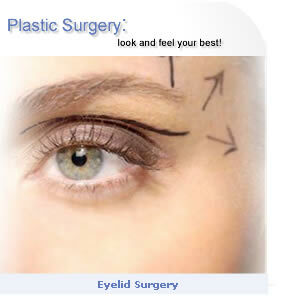 The eyelid surgery of choice for puffy eyelids is Blepharoplasty. This cosmetic procedure deals with the skin and fat tissue deposits directly below the eye socket. The surgery is short lasting one hour normally. You will go home with your beautiful new streamlined eyes the same day. Expect to see your surgeon about a week following the surgery to remove stitches that are securing the skin in place. Will having the fatty tissue removed from my eyes leave a scar? This is a very common question, and the great news is it will not. Scarring is absolutely minimal at the two week stage and by a few months, undetectable. Most people eye work is invisible at the few weeks mark. The Surgery-Lower Eye led blepharoplasty. The plastic surgeon will remove saggy eyelid fat and skin from below the eye. This will transform the face's profile, removing puffy trans dermal fat, excess wrinkles as well. The procedure will remove many of the signs of aging from your skin, and the effects will last a lifetime, to a degree. What eyelid surgery will not do for you. Eyelid surgery will not remove darker skin or circles you have under your eyes. These dark circles under the eyes are genetic most of the time and must be addressed in another fashion. Eyelid Surgery will not fill out the area between the cheekbone and the lower eyelid. This will need to be addressed separately with your doctor at the consultation. Fat grafting to the eyes is the most common procedure to take care of this. Removing the fat around the eyes will not help with crows feet, which start in that area. The surgery process for removing eyelid fats. The doctor will make A micro incision along the lower eyelid lash line. The plastic surgeon will then remove the Excess fat, muscle and skin. Very tine stitches are placed to seal the incision. Permanent sutures are removed 2-4 days during your follow up consultation. Plan to rest in your home for two days following the surgery. The doctor will prescribe on antibiotic ointment for your eyes to heal properly. After two days most people are back to normal. Consult with your doctor following eyelid fat removal for when to resume exercising, or strenuous activity. Who is a good candidate for this surgery. * Persons with no known medical conditions,including high blood pressure, circulatory reduction, hypothyroidism or same thyroid related issues. If you meet the medical requirements and desire to remove the excess eyelid fat from your lower eye, consult your local plastic surgeon.